Tell Me Exactly How Private Syndicates Work? FIRSTLY, LET’S TRY to give you a clear definition of a property syndicate. A property syndicate is a direct property investment through a trust structure – whereby numerous investors pool their equity, to invest into commercial real estate. As a general rule … the objectives of a property syndicate would include investing in properties with quality tenants, long-term leases, strong returns and with a good potential for capital growth. In other words: The aim is … to bring together like-minded Investors seeking to achieve a common investment goal. As you’re probably aware, Australia has thousands of Public syndicates investing in office towers, shopping centres, industrial facilities, private hospitals, hotels and kindergartens – sometimes even involving residential development and mezzanine debt (for those who like a higher-risk investment). And generally, these syndicates involve between 200 and 500 investors. However, a Private Syndicate generally only has 4 to 6 investors – no certainly, more than twenty investors involved. 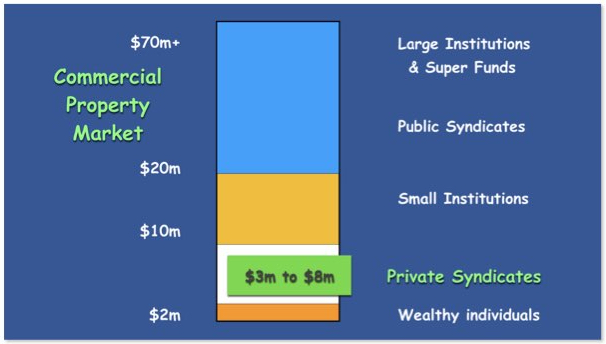 As you can see from the chart below … Private Syndicates are able to take full advantage of a sweet spot in the market (between $3 million & $8 million) – where the Commercial properties seem to be too expensive for most Wealthy individuals, but priced below the range attractive for Small Institutions. This is where like-minded investors are able to band together, in order to acquire good-quality Commercial investment property – secured on long-term leases, to established tenants. And the attraction with Private Syndicates is that you (as an investor) actually run the show. With many people involved, there is no sense of belonging. As such, the Syndicate Trust Deed is very much a working document – because it actually provides you with the comfort you require … by including numerous safeguards. Anyway, if you’d like to learn more … you can download this Paper which has been put together to explain it all to you in further detail. Or simply click on the button, to pose another question you may have just thought of.